It’s a long way from preparing a Modified Ford under a shade tree at the family homestead in Buffalo Ridge, VA. From fielding a dirt car in the early 1950’s to starting two teams in an online racing series in 2019, the Wood Brothers have now done both. 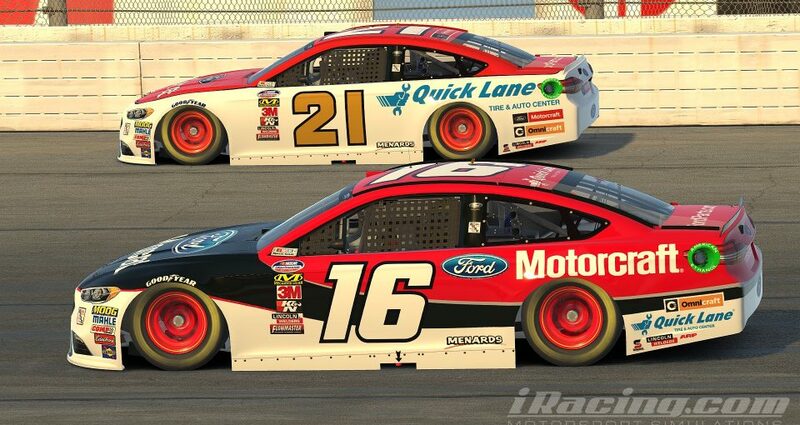 Wood Brothers Racing, NASCAR’s oldest continuously operating race team, has joined several other NASCAR Cup Series car owners in competing in the eNASCAR PEAK Antifreeze iRacing Series, which is the iRacing equivalent of the elite Cup series. The Wood Brothers will have two teams, with iRacing standout Ray Alfalla, a four-time series champion, piloting the No. 21 Motorcraft Ford Fusion and Chris Overland at the wheel of the No. 16 Quick Lane Ford Fusion. The online simulation racing series features 40 of the world’s best sim racers running events in Monster Energy Cup Series cars on the same tracks in which the Cup series competes. Jon Wood, Director of Business Development and co-owner of his family’s race team, and a participant in iRacing himself, applauds NASCAR’s decision to increase its presence in the online aspect of the sport. Wood said his interaction with fellow sim racers in another league he races in, called CORT and is short for Championsip Online Racing Teams, has shown him the value in being a part of the new PEAK league. NASCAR and its broadcast partners plan to step up their promotion of iRacing, and NASCAR will provide a series director. Sim racers, like their counterparts in conventional racing, start in the lower divisions, with only the elite talent advancing to the pro level. Those who advance, like in any racing series, tend to be the ones who have both exceptional talent and top-of-the-line equipment. Wood said the sim equipment used in iRacing is state-of-the-art. “Some of these rigs I’ve seen are comparable to the simulators that pilots use in training for flying real airplanes,” he said. The 2019 PEAK Series features 18 races from February through October, and the events will be produced and streamed live on several sites including NASCAR.com. Like the conventional NASCAR racers, sim drivers will earn purse money, and this year’s champion will earn $40,000. Wood said he’s confident that Alfalla and Overland will help his team continue its legacy of success in the sport.